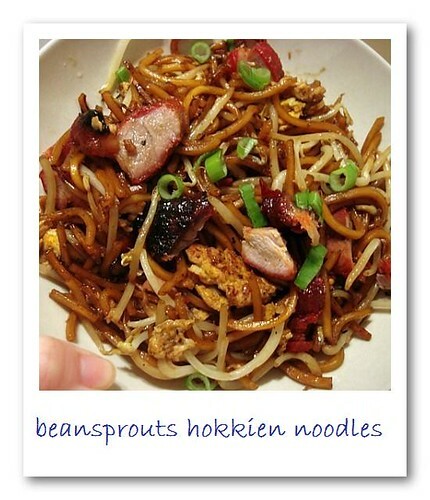 Beansprouts Hokkien Noodles aka Taugeh Mee. 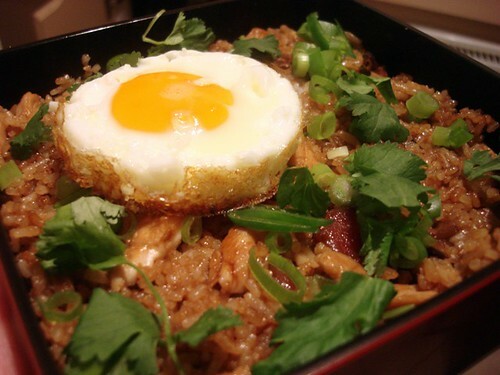 Claypot chicken rice topped with fried sunny side up. 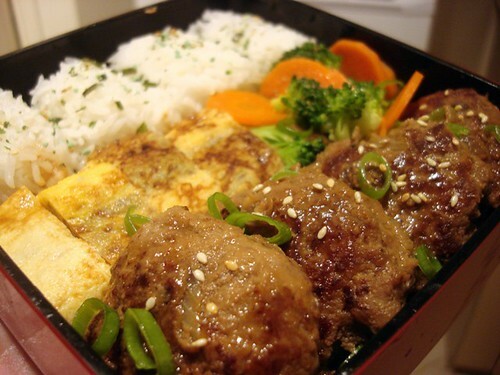 Teriyaki hambagu, tamagoyaki, brocolli and carrots with rice. 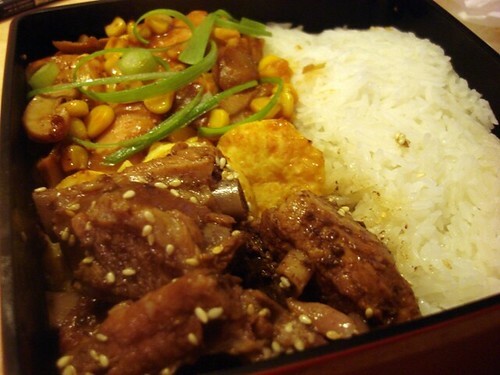 Rock sugar and vinegar braised spareribs, Japanese egg tofu and sweet and sour mix vege with rice. Which was your favourite ? When I was living in Malaysia, National Day was just another public holiday. But ever since I’ve moved to Perth, Merdeka Day is suddenly a day of celebration and fanfare. 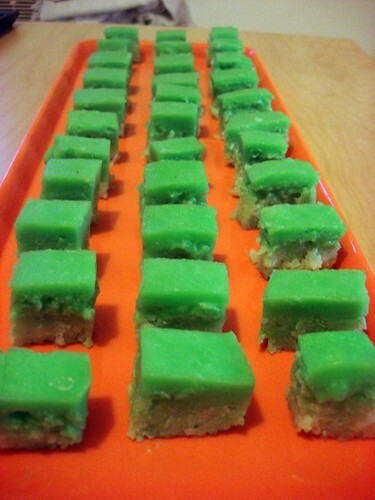 2 weeks earlier I already told all my friends that I would host a Merdeka Day gathering and that everyone had to contribute a Malaysian dish. Even though Asrul was not around, I wanted to continue his tradition of having a Merdeka Day dinner, but I didn’t realise it was such hard work! Warning: This is going to be a photo laden post. But I’m so glad I took photos because the weekend went by in a blur and I am so tired now that I don’t remember what I did (=-____-=). 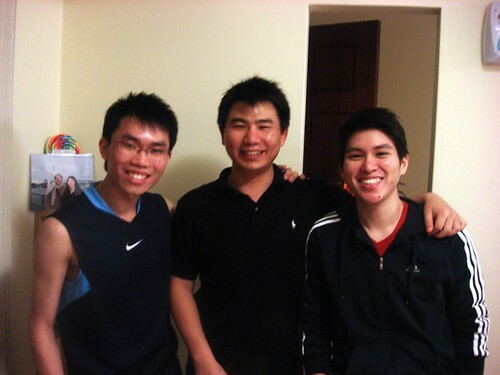 It started on Thursday night when we went to Gerry’s house for dinner after a game of badminton. He cooked for us! Lately I’ve been very lucky to have my guy friends cooking for me, I really liked his tomato egg dish and want to learn how to cook it. I am going to try and plan my weekend dinners better in future. All the restaurants that we wanted to go to on Friday night were fully booked and we had to settle for Senoji which has deteriorated since I last visited and was seriously underwhelming. 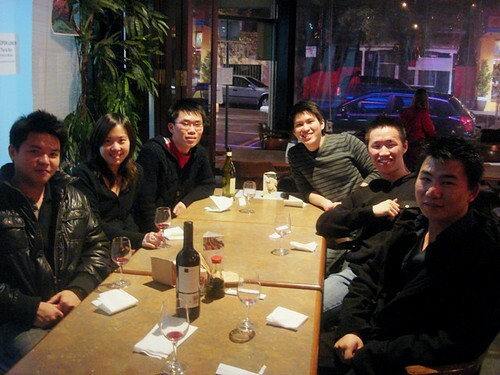 So underwhelming that we had to go to Toto’s for another round of Vietnamese to fill up the guys’ tummies. 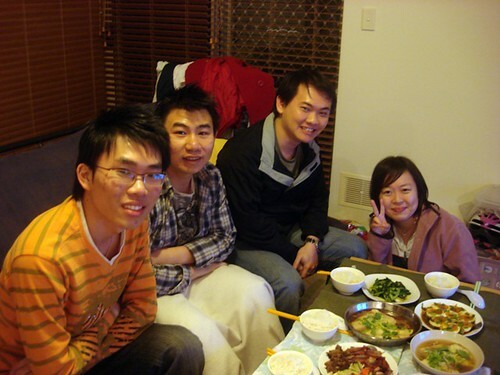 Then it was straight to Xinlong’s house to wait for him to come back from work at midnight. Saturday morning was shopping in Northbridge for Sunday’s dinner ingredients. I had such a looong list, luckily the guys were there to carry the bags afterwards. It’s always nice when you meet friends by coincidence, we bumped into Jason and Wendy who were shopping for Sunday as well! Since everyone was there, I brought them to Zekka for coffee. Where good coffees can be found! I’ve decided that I might prefer the coffee at Tiger Tiger after all, but Zekka is pretty good too. 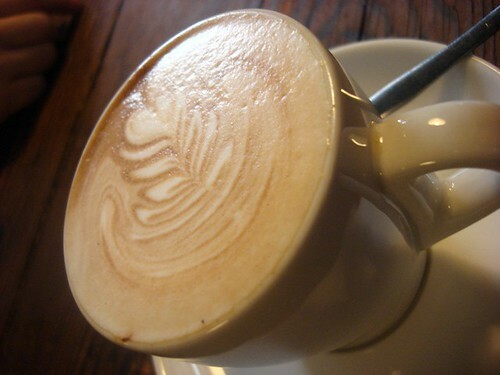 It was nice sitting on the wooden table chatting and drinking coffee. I don’t even remember most of the conversation now but I think Wendy and I were discussing handsome men, haha. 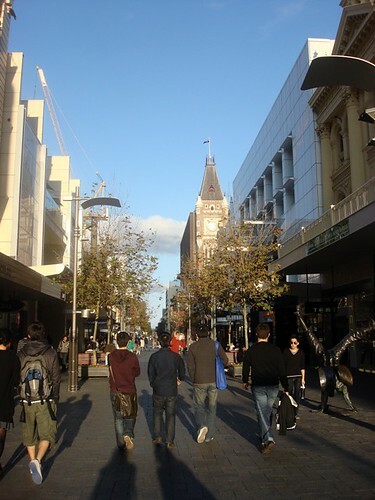 We visited the new shops in Enex 100 and walked around the city , can you spot the guys in the crowd? Then it was back home for a night of preparation. I knew that I had to prepare my chicken curry the night before or I would be stressed out the next day with other dishes to prepare. My sous chef in the kitchen for the Merdeka Day was none other than Dr. Richard. Truly he was amazing in the kitchen and such a great help, I felt so relaxed cooking around him which others can testament usually doesn’t happen when I have visitors in my kitchen. Thank you rabbit. We picked up Gerry late at night for a McD supper, the first thing he said when he got into our car was ‘you guys smell like chicken curry!’ then it was watching the thrilling Man Utd vs Arsenal match at Bryan’s house, Man U won! This went on till 4 something in the morning and I didn’t get to sleep till 6am. Sunday was D Day and I woke up at 9am to headed to the city with my sous chef for last minute ingredients. Then it was straight into the kitchen for an afternoon of ‘prepping’ and cooking. 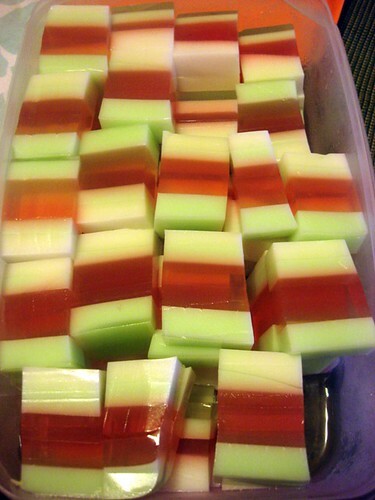 Fang Da Tong was my background music 🙂 Entree of the night was my Kuih Salat which to me was an epic fail but everyone else said tasted good. Jo is becoming the Agar agar princess, her agar agar was so pretty and tasted great as well. 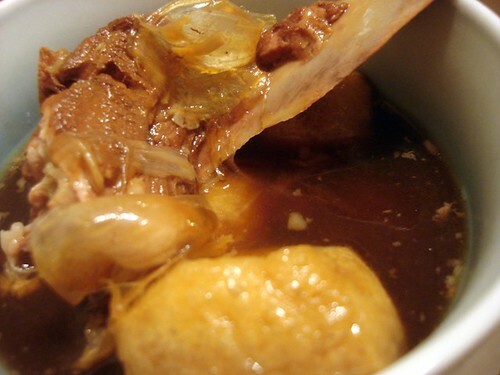 Jason and Wendy’s Bak kut teh, very flavourful with chunks of tender pork ribs. 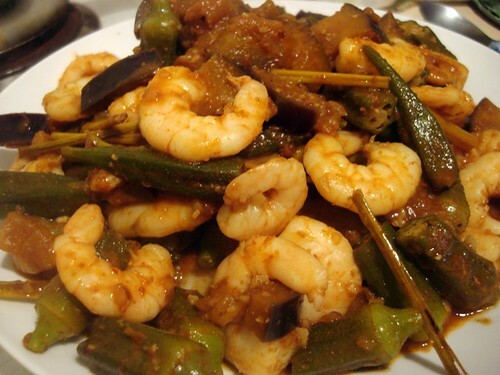 Richard’s sambal prawns which was reminded me of hints of my mum’s sambal prawns because I called my mum to ask her for the recipe. I loved the brinjals and okra, too bad there was no daitaohas in there. It would be nice to feature daitaohas in a daitaoha blog right? Richard’s sambal fish which he tried to recreate based on what we described of my mum’s cooking, it wasn’t the same but was still very tasty fish. I’ll have to go back to Malaysia for my ah ma’s cooking 🙂 . 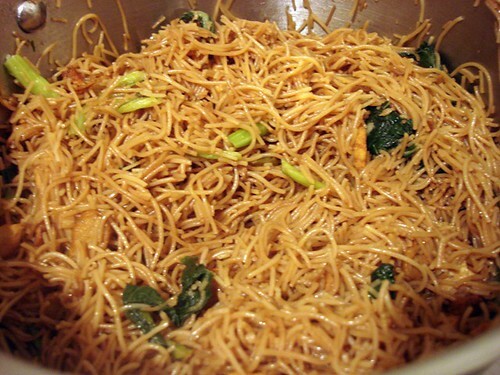 Bryan’s beehoon which went great with chicken curry sauce, the whole pot was empty by the end of the night. 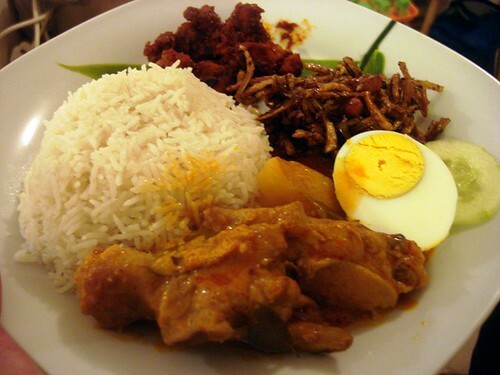 My nasi lemak which I served with chicken curry. 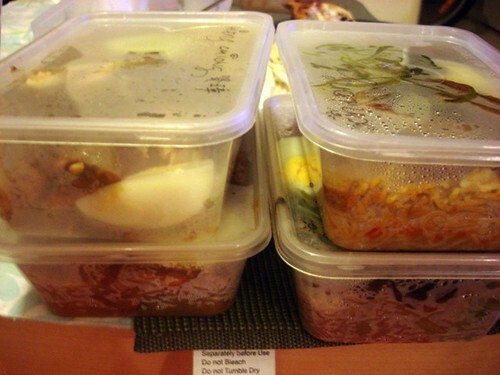 I quite liked how the chicken curry turned out, but I think I still need to improve on the nasi lemak. Instead of the normal sambal, I had sambal sotong which is my favourite condiment of traditional nasi lemaks. I think the only thing I didn’t take a photo of was Gerry’s Sambal Kangkong, sorry Gerry! 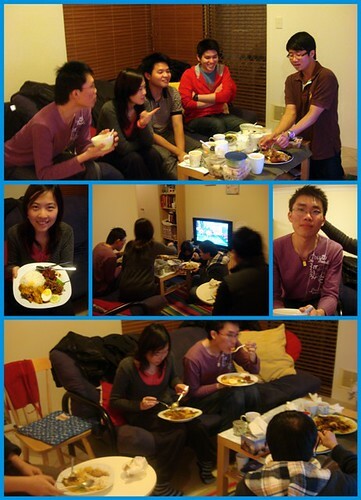 Everyone chomping away, Jo also served us Air Bandung, it was a real Malaysian feast! 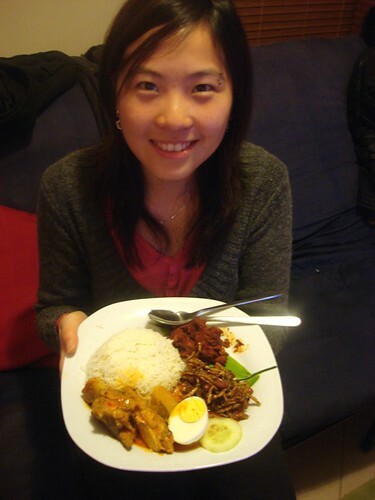 Pretty Wendy with my nasi lemak. Time for dessert. We were really stuffed and I couldn’t even make it to dessert. Even our dessert was Malaysian, Jo’s Bobochacha had chunks of sweet potato, sago and purple potato. I think we overindulged with coconut milk that night. 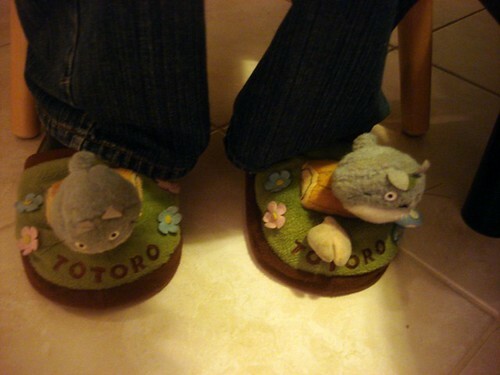 Random picture of my totoro bedroom slippers which are very old and broken but I still love because Totoro is so cute. 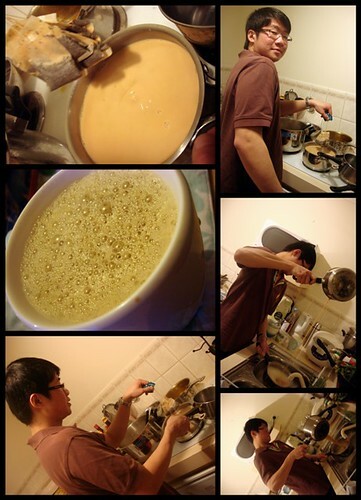 Xinlong the Teh Tarik man ‘tarik-ed’ mugs of frothy sweet teh tarik for us, does he look professional?? Even though the preparation was a little tiring and I was quite worn out by the end of the night, it was all worth it because we all had a great time and it was definitely a memorable event, at one point, we even sang the Malaysian anthem *shy*, thanks for coming everyone and contributing great dishes, happy merdeka 2009! A my colleague who is also my unofficial mentor at work brought me out for lunch on Tuesday for what he calls a ‘brain dumping’ session. 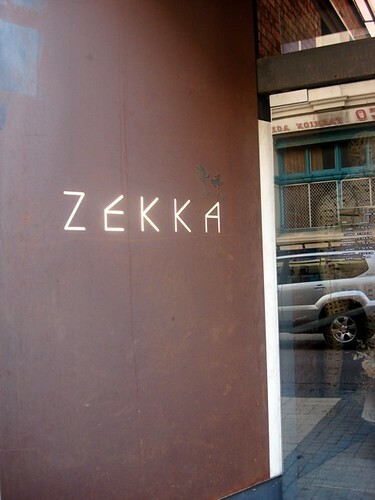 He is always raving about Zekka, the coffee shop hidden at the far end of King Street. When we walked down the very quiet alley, I realised it was a part of King Street that I’ve never been before. 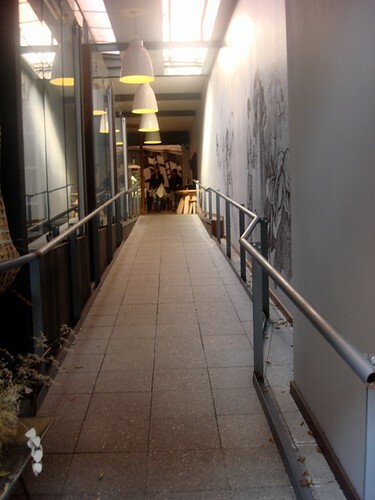 Zekka is also a men’s clothing store, so you don’t actually know it serves food and coffee till you walk down an ultra cool corridor.Everything aout Zekka is very cool and original, even the number plates for the tables are funky. 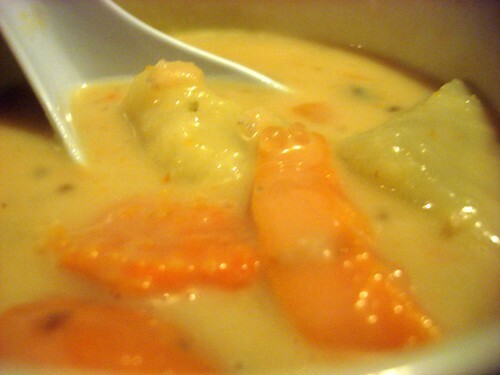 A’s leek soup which he says was very good. 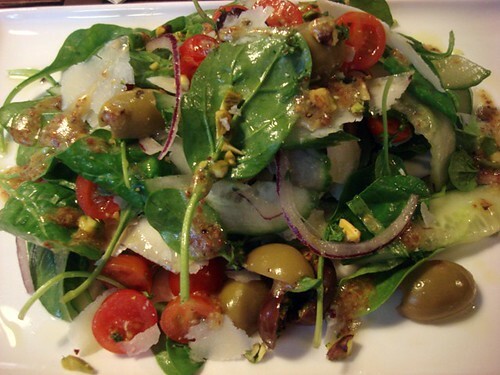 My salad which had olives, red onion, cherry tomatoes, cucumber and parmesan shavings. It was very tasty but I couldn’t finish it because it was so huge. The coffee was good, I’m not sure whether it’s the best that I’ve had, but I know I didn’t need any sugar in my coffee because it was already so fragrant and smooth. It’s a pity Zekka closes at 5 because I would love to go there for coffee on Saturday nights. 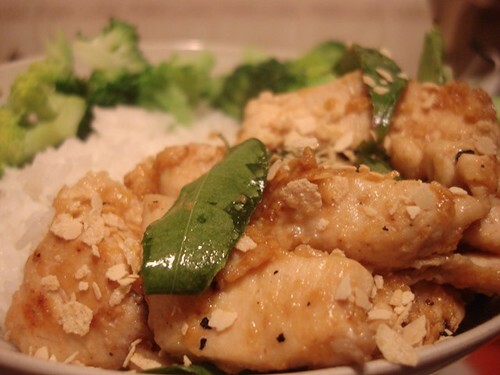 Last week I cooked Nestum chicken stir fried with curry leaves and chilli, I like the crunchiness of the nestum flakes with melted brown sugar. Tossed with blanched brocolli, it was my brocolli chicken salad lunch for work the next day. 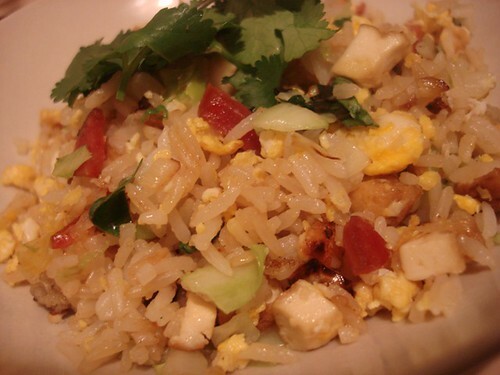 Leftover rice was a good excuse to cook garlic fried rice. It was the first time I tried having shredded basil leaves in my fried rice and I think it worked quite well. 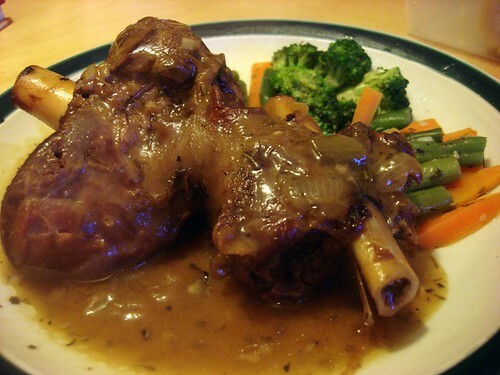 But in the end, he came over with these beautifully presented dishes of lamb shank, veggies on the side and drizzled gravy. All we had to do was reheat the dishes in the microwave and it was good to go. My verdict? I think he did very well for a first try (^___^). He first roasted the shanks then braised them, I asked him how he would describe the sauce and he said ‘ i dunno.. i created it myself’, haha, I think it was herbyand flavourful. Richard says he knows his mistakes now and he promises that I will have good lamb shanks by the end of the year (so long!). 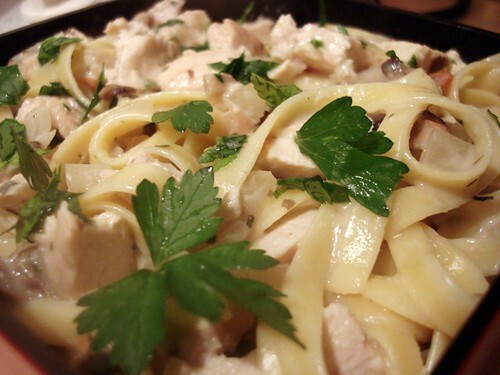 Anyway, I was still really touched that he went to all that effort to cook such a difficult dinner for Jo and I, so thank you Rabbit, happy to be your white mouse anytime (=^__^=). 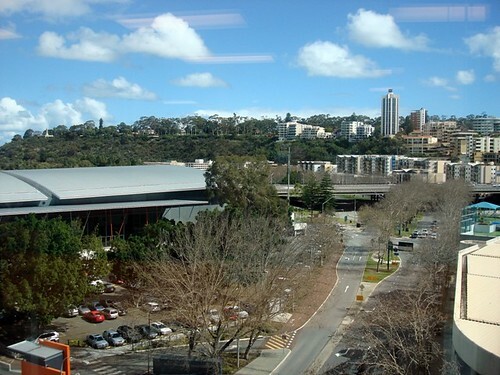 Yesterday the newspaper reported ‘Perth is experiencing the dullest August in nearly three decades with just 5.6 hours of sunlight a day, compared to the average 7.2 hours’ . Sigh, it’s been a very rainy and gloomy August. 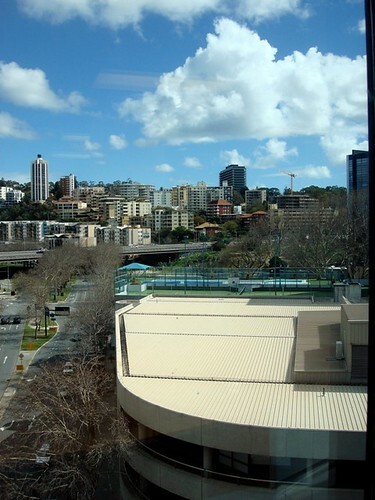 Which means all my attempts to take photos of my new building with the glass windows failed miserably (T___T). 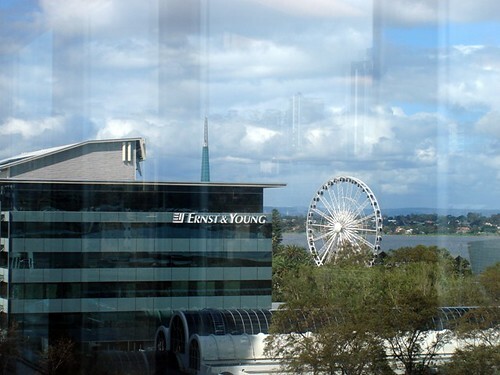 Anyway, here’s part of the view from my boss’s room. She has a fantastic office, I don’t know how she gets any work done, I would be day dreaming all day. 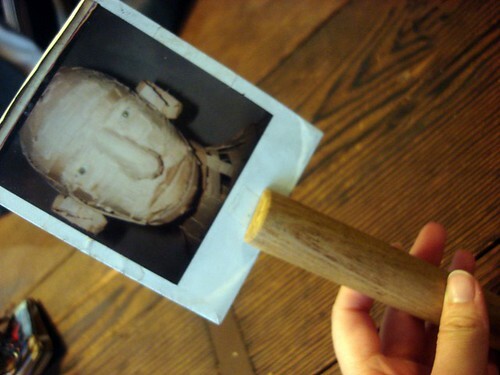 Actually I already day dream all day (=^.^=). 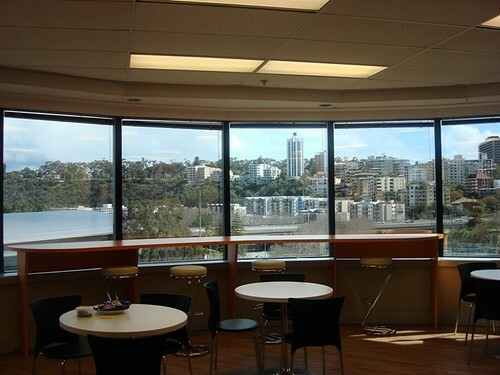 The lunchroom is my favourite part of the entire office. It’s so cosy, warm and happy. My colleague T and I always sit together right in front of the window and eat lunch together. Sometimes we chat and laugh, sometimes we sit in silence, staring out of the window at King’s Park, the passing cars, the blue (or for the month of August grey) skies. It’s my comfort zone and where I go to breathe when work is overwhelming. We always look longingly at the empty swimming pool and tennis court at the neighbouring building. The other day I had lunch with a friend who also works in a nearby building and he said that his colleagues also stare at the swimming pool everyday, hehe (^___^). 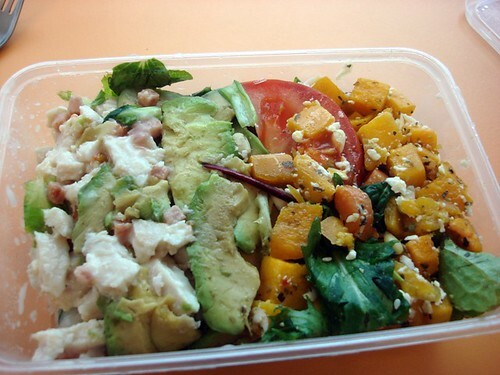 This was my lunch last Friday, a combination of chicken and avocado salad and pumpkin and pinenut salad. It was really refreshing and nice, how come I can’t make nice salads like that? T and I always gape in disbelief at the displays of bad driving on this road, illegal U-turns, driving up the wrong way of the road, you name it, we’ve seen it. 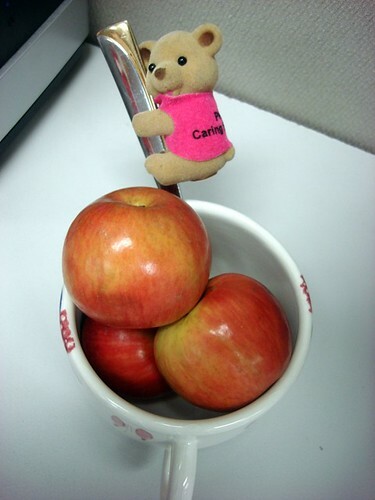 My cup of apples made it to the new building! And teddy tagged along too (^__^). Ok, that’s all for now, I promise better pictures once the sun comes out. 3 more sleeps to Friday …. My colleagues always shake their head in disbelief when I tell them that I only have coffee during the weekends ‘but coffee is good for you!’ they exclaim. I don’t quite know how to explain to them how by waiting till the weekend to have coffee, coffee doesn’t become just a daily habit, it becomes something to be savoured, something to look forward to. 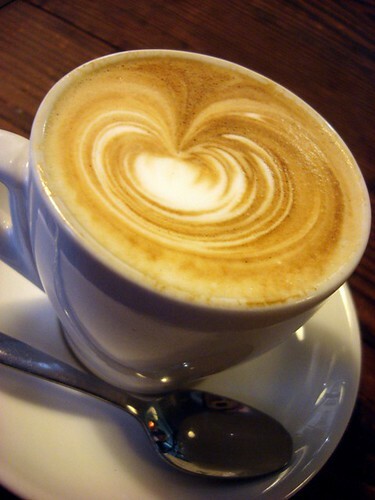 This weekend, felt like the first sip of a hot, smooth, fragrant and frothy coffee on a Friday night. Sooo good. It started on a late Thursday afternoon lunch at the revolving C restaurant. For those who have visited Jo’s blog, know that she loves the C restaurant credit crunch lunch special for the month of August. 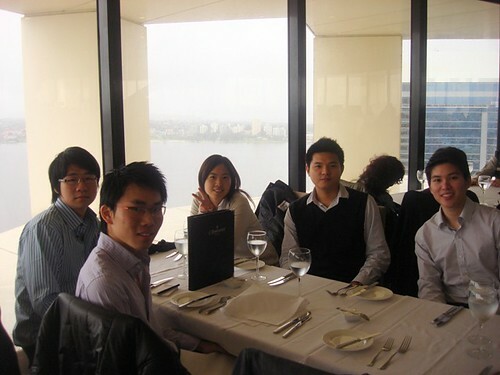 Keen to try the food for myself, I arranged a working lunch with my friends. It was nice seeing everyone all togged up in their smart working gear, but in truth, the lunch wasn’t so enjoyable. The food took too long to come, Wendy and Jason had to miss dessert to rush back to work, I was on the edge of biting my nails while glancing at my watch every 5 minutes. And the food, was hit and miss. We tried everything on the menu though, and I brought my notebook, so lengthy post in the faraway future. At night we met up again for late night window shopping in Carousel. It was a fun night, knowing that Friday was just around the corner lifted my spirits and lightened my steps. And then it was FRIDAY. It was an unplanned dinner, but we decided to have a Chilli Mussels night similar to the one I had when Jan and Andy were in Perth. The menu, the famous Conca’s chilli mussels extra hot, Ciao Italia’s chilli mussels and home cooked pasta. 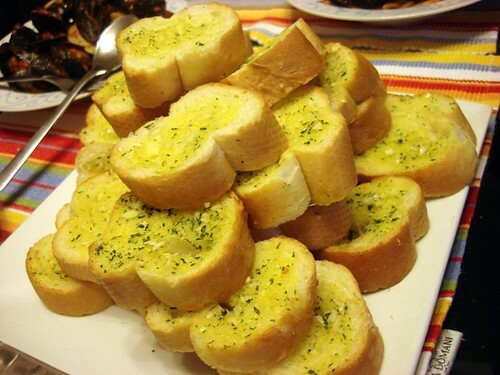 I also made garlic bread. 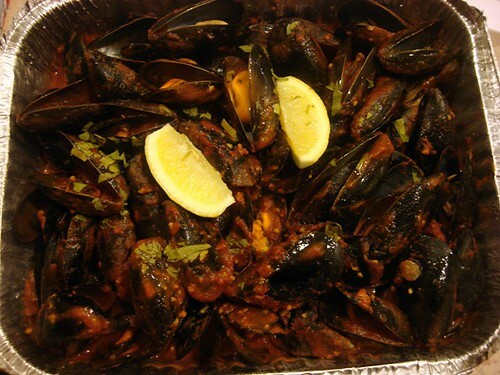 The last time we had Conca’s chilli mussels when Jan and Andy were around, it wasn’t that hot. This time, the sauce was lip numbing smoking HOT. So spicy and hot that most of the guys had trouble swallowing the pasta. It was a tongue hanging ears smoking situation. Not really enjoyable. 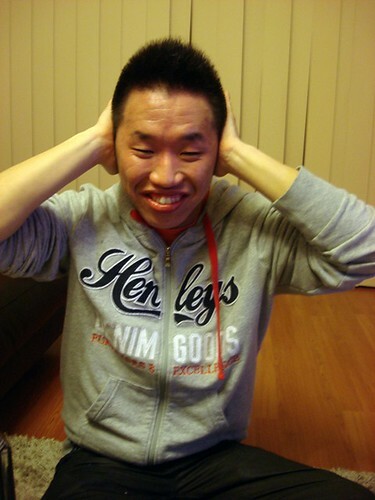 I mean look at Calv in these photos, I couldn’t find a photo of him without his jaw gaping wide open, I swear, smoke was coming out of his mouth. It was so spicy Ming Sian cried. (T______T). There were tears running down his cheeks and his face turned sooo red, it was like he was a fire engine. 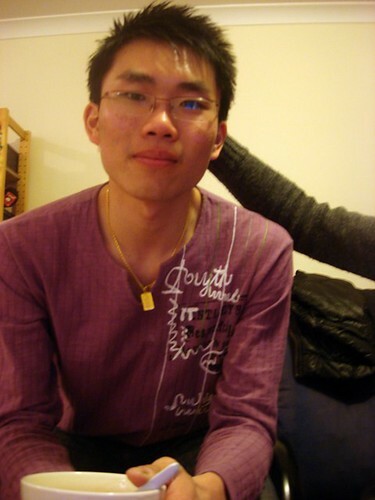 Xinlong joined us later in the night and was so tired. The poor guy is juggling 3 jobs right now and sleeps an average of 3 hours a day. I knew he was in a really bad situation when he didn’t enjoy his warm mud cake with icecream. Saturday was unplanned but somehow we ended up at Xinlong’s place in the afternoon. It was a trip to Nedlands for some not-s0-good Vietnamese nosh but a nice first coffee of the weekend at Dome’s in South Perth. 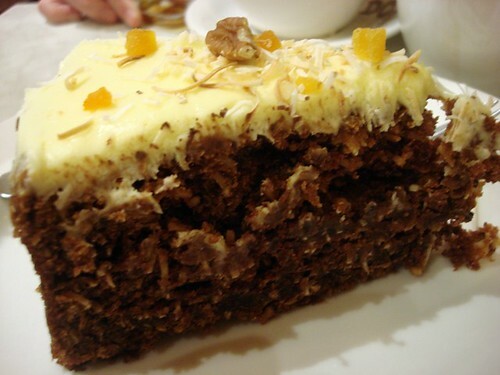 The carrot cake was pretty tasty too. What did we talk about? Maybe nothing but it was relaxing and chatty. Thinking the night was going to end early, a phonecall from Din Yaw changed our minds and they came over to my place for drinks. 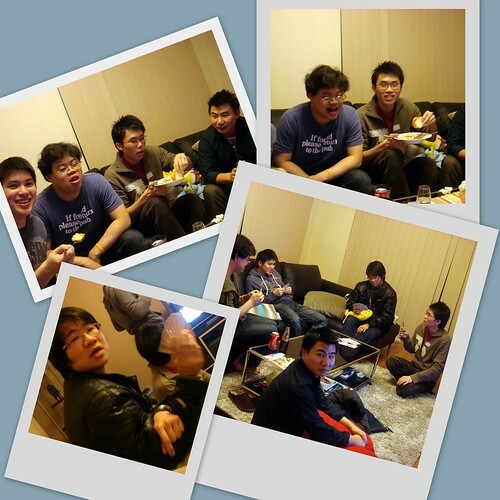 Then the party trooped to Xinlong’s house and the night unravelled from there. 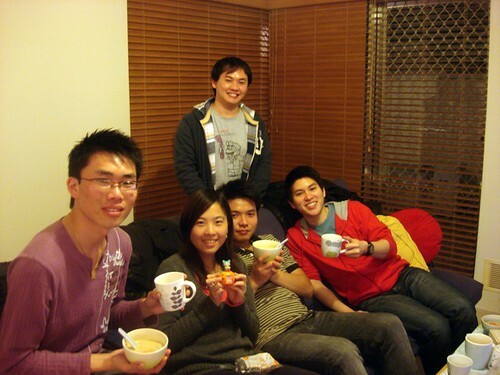 Jo and HiengChiong came in past midnight and joined in the festivities. It was a night of lame IQ jokes, drunk philosophy from Gerry, beehoon cooking, leftover bak kut teh and a lot, a lot of red wine. Let’s just say I’m glad Richard was by my side most of the night, so thanks Rabbit(=^^=). 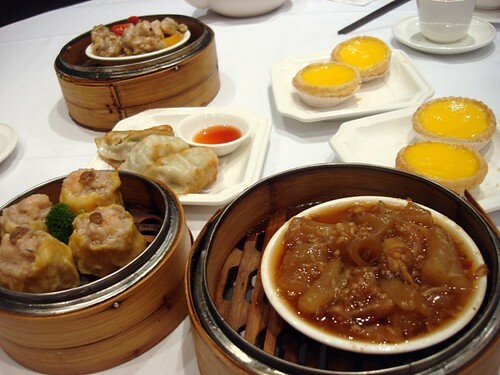 But Jo, Hieng Chiong, Richard and I still managed to wake up on Sunday morning for dimsum at Royal Seafood restaurant, which is now probably one of my favourite dimsum places in Perth. The dimsum was a bit salty but otherwise there was a wide range to choose from and the dimsum all had a little twist added to the norm. Good service helped too. Window shopping at Harbourtown afterwards and visiting MingSian at his workplace. 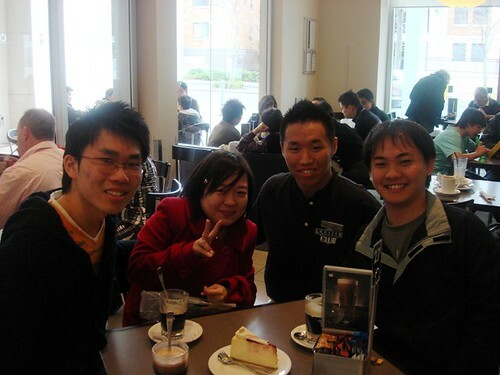 We managed to get a picture with him in his barista outfit too, hehe. Mingsian was too busy and I didn’t get to drink his coffee which is a pity because I always think they taste specially nice (bias lah). The non stop activities for the weekend was getting to me and my energy level was low. I told the guys that I was planning to stay in for Sunday night and they all agreed to stay in too, suddenly, it was a homecook dinner situation and everyone was chipping in dishes. 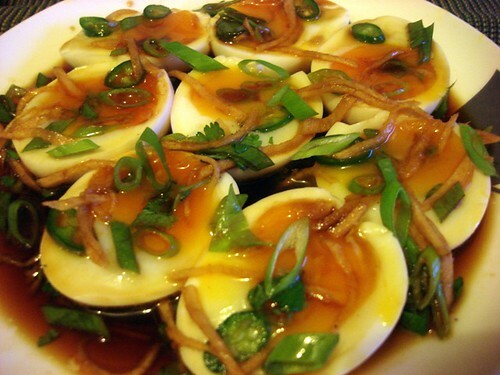 Being lazy, my contribution was a non-fussed half boiled eggs with spring onion and ginger dressing. 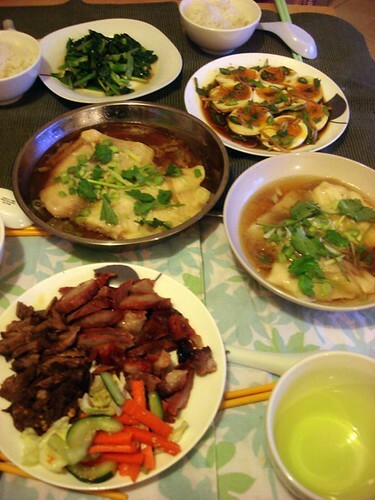 Richard did the rest of the cooking, stir-fried kailan and steamed fish. 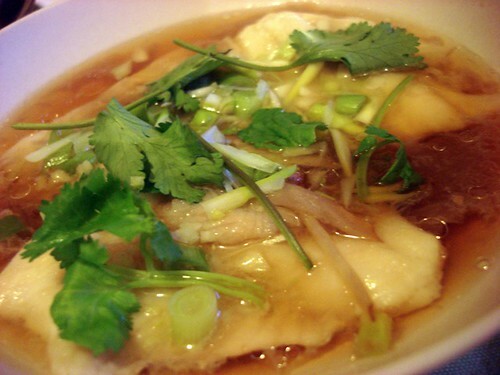 And very nice steamed fish it was too, we swop recipes, I gave him my spring onion dressing and he told me his fish sauce. I also chopped up some leftover braised pork belly and char siew. 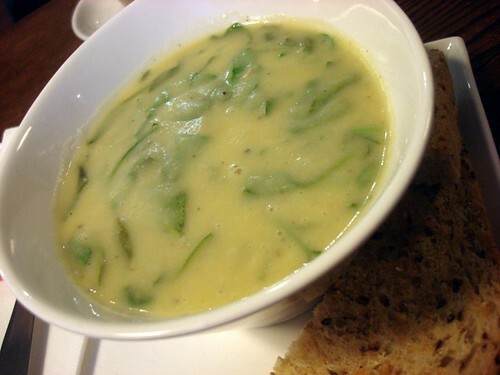 Gerry made green bean soup for dessert which was nice and sweet. 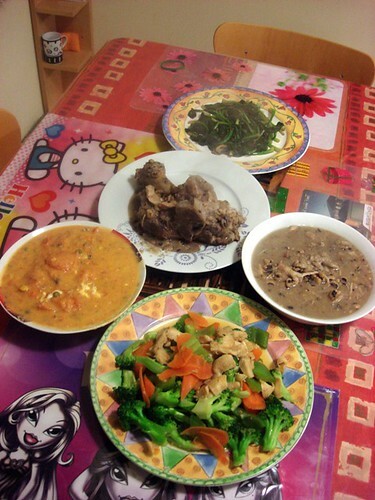 It was a simple dinner with simple homecooked food, a perfect Sunday night ending to a fantastic, warm and fun weekend. It’s a hectic work week ahead, but the warm glow from the past weekend still lingers and I started Monday with a smile. I really must remember to bring a notebook when I eat out, by the time I get round to blogging about these restaurants, I’ve forgotten most of the dishes and what they taste like. So fellow foodies, please remind me next time you go out ‘fooding’ with me, or even better, help me bring a notebook and pen. Before I continue with Ninniku Jip, I must admit that Korean is probably one of my least favourite cuisine, maybe I haven’t eaten really good Korean food but I just don’t love it the way I love Japanese or Thai. Instead, I associate it with bbq-ed meats, lots of smoke and smelly clothes afterwards (-___-). Ninniku Jip means the Garlic House in Korean, although it advertises as a Korean restaurant, a lot of the food on the menu was Japanese. One thing that struck me about their menu was, not much choice. 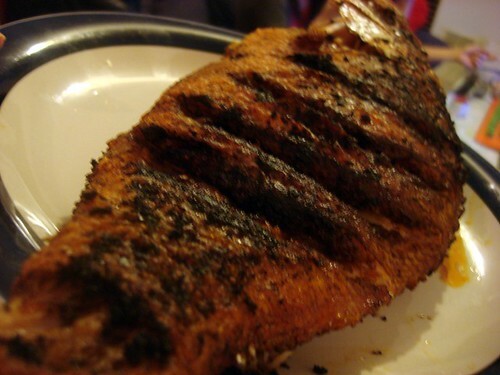 Everything sounded similar to each other just different ingredients like chicken, beef or seafood. 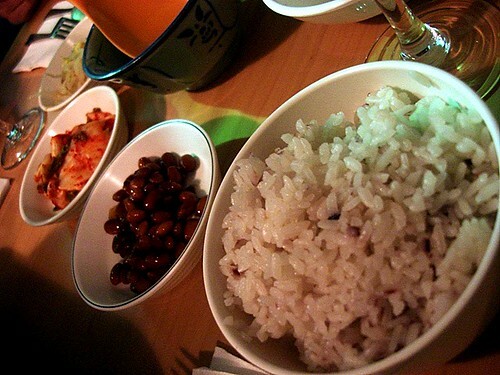 Many of the dishes came with side dishes and rice, we all liked the kimchi which didn’t have that ‘dish liquid’ taste that I dislike. We ordered a hotpot for two, opting for the Bulak Jungol ($22.50 per person) which came with beef, baby octopus, tofu and veges. 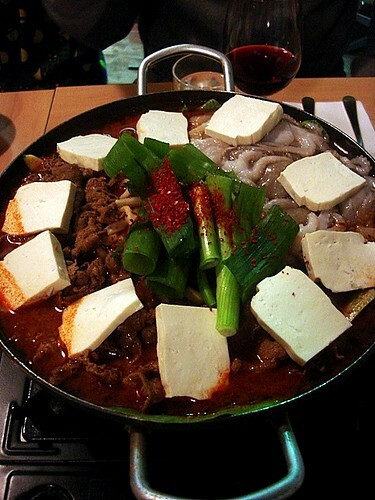 This hot pot was pretty spicy and tasted quite nice (see this is what happens when I don’t bring a notebook). Rather large portion for two as well, luckily we were all sharing. When our dishes were served, I was pleasantly surprised to discover no ‘smoking’ effect. 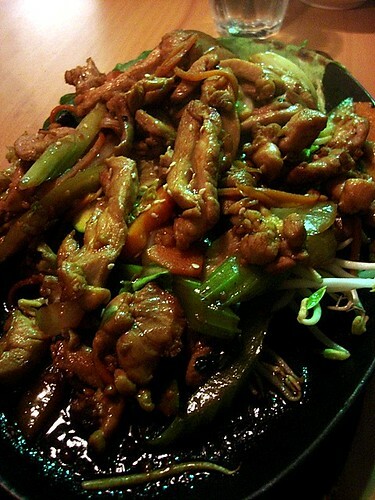 That’s until the Sizzling garlic chicken bulgogi ($22.80) arrived, we pretty much smoked out the entire restaurant and some people from the other tables were coughing. I thought this dish would be really good since the Garlic House must serve great garlic chicken, but really, it didn’t taste of anything much and was very bland. 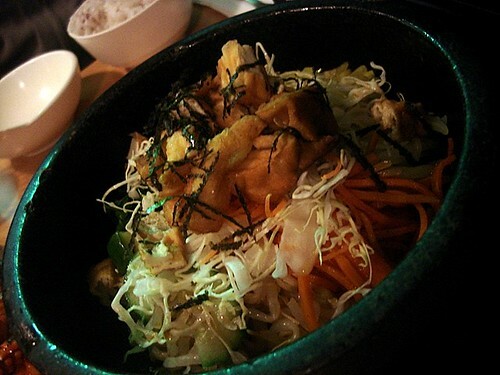 The Ishiyaki vege bibimbap ($21.50) was pretty bland for me, but I think the rest of the foodies quite enjoyed it. I think maybe I didn’t add enough gochujang paste in the bibimbap. The Sizzling chilli squid ($22.80) was easily the favourite of the night, it was spicy and tasty and went well with rice, the texture of the squid was nicely done too. If I ever return to Ninniku Jip, this will be a reorder. We ordered the Seafood yakisoba ($15.80) because we were running out of things to order, the menu rotated around various bibimbaps, hotpots, sizzling dishes and noodles. So we had one of each. 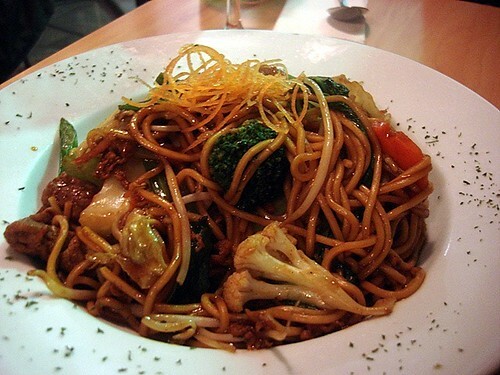 This yakisoba was quite ordinary, slightly sweet and not too oily. With our entertainment book discounts (25% off), the meal was quite affordable otherwise I doubt I will return for the prices and food. 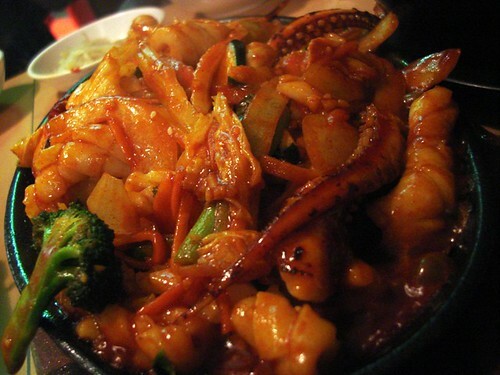 Except maybe for the chilli squid.The rest of the foodie gang gave the meal a 6.5 (and perhaps 7 for the chilli squid) but I think in comparison to Hanami (which scored a 6.5) Ninniku Jip wasn’t as good so I gave it a 6. I must mention that their service was really excellent though.